After close to 30 years trading as 'The Boxerman' I've finally decided that it's time to hang up the spanners and retire. I'd like to take this opportunity to thank those many loyal customers who have relied on me for so many years (I think many of those long term folk have been aware for some time that this was happen soon). You'll all be missed so don't be strangers. Sam spent eight years travelling the world on his trusty R80G/S and these four books portray that journey along with it's excitement and it's dramas, it's highs and it's lows. 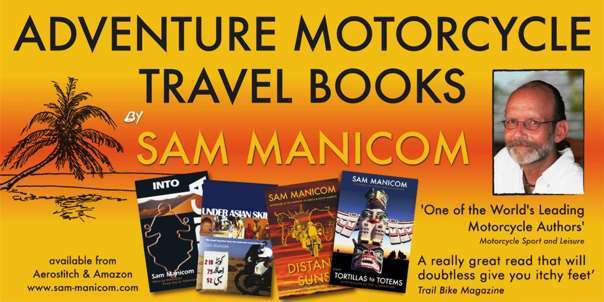 These books are a superb read and Sam's unique riding style has you travelling with him. The books are available to purchase from Amazon but if you would like a signed copy then just order direct from Sam's own website below. Times are changing and how/what we read are changing with those times. We've had constant requests to put my four adventure motorcycle travel books into e-book format - a surprising number in fact. At first I was rather skeptical. I like the tactile feel of a paperback. But the more we looked into it, and had tryouts on such things as the Amazon Kindle, the more we became convinced that e-books are great for bikers. Also for commuting on the train or bus or for heading off on holiday. Why are e-books good for we motorcyclists? You can get somewhere in the region of 3,000 books onto an Amazon Kindle, for example – just think of the space saving! And if you have the right model you can also use it for browsing the web whilst on the road. Very handy for finding places to go or even places to stay when you are out ‘there’.